Sister Alma Ruth's ambition was to become a flight attendant, and the 23-year-old was anticipating a long-sought vacation to Hawaii when she came to San Francisco's Haight Ashbury district to visit the Sisters of Perpetual Adoration. A younger sister was considering a vocation to the cloistered contemplative order, and Sister Alma Ruth thought she'd just visit. The monastery, founded in 1928 by sisters fleeing the Mexican Revolution's persecution of the Catholic Church, is devoted to constant prayer before the Eucharist. A Jesuit priest, Father Dionisio Kavanaugh, helped the sisters from Guadalajara move to San Francisco, as he had helped the Carmelites the year before. There are three other U.S. monasteries in Anchorage, Alaska and two in El Paso, Texas, and about 80 worldwide, but the core remains in Mexico with 60, said monastery superior Mother Rosalba Vargas. "My vocation was very fast. I came, I liked it, that was it," said Sister Alma Ruth, now 50, and bilingual in Spanish and English. The mistress of novices told her parents, "I don't want to go to Hawaii. I want to go to the sisters." Now, her full name is Sister Alma Ruth of the Holy Spirit because she entered the order on Pentecost Sunday 1983. "I was very happy for them," said Mother Rosalba, at 53 the eldest sibling of Sister Alma Ruth and Sister Betzabet, 45. The three were middle children in a family of 10 children who had emigrated from the province of Michoacan, Mexico. "I never thought I was going to end up here," Mother Rosalba said. "I grew up thinking I didn't have a vocation." 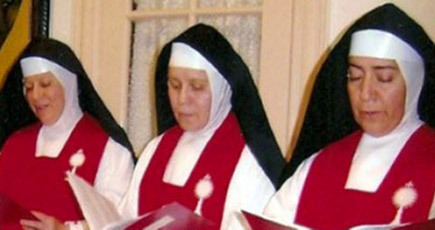 Although three sisters in one community is remarkable, vocations to contemplative life can run in families, said Father Francis Filice, the diocesan priest appointed chaplain in 1996. An example is St. Therese of Lisieux who was with four of her sisters in the Carmelite monastery in France. The Sisters of Perpetual Adoration were established with papal permission in 1807 by an Italian Franciscan nun who had a vision of Jesus calling for an order devoted to adoration of the Blessed Sacrament. Blessed Mary Magdalene of the Incarnation was beatified in 2008 by Pope Benedict XVI. "What's amazing to me is how happy they seem to be despite the fact they are closed up all the time," said Father Filice. Particularly impressive is the kindness the women show to each other, he said. "A monastery of cloistered nuns is like a lighthouse set on a hill. It reminds the whole diocese of the presence of God in its midst," wrote Dominican Father Gabriel O’Donnell in a citation on cloisteredlife.com. Pope Benedict XVI calls contemplatives the "heart" of the Church. "...your hidden lives with Christ, imbued with work and prayer, contribute to maintaining the Church, the instrument of salvation for all mankind whom the Lord redeemed with His Blood," the pope said in June. When the three Vargas sisters entered the monastery at 771 Ashbury St. in the early 1980s, there were 30 members. Today there are 12, four in their 90s, some of whom have spent more than 70 years in the monastery, the sisters said. Potential vocations now come via the monastery website, adorejesus.org. Sister Alma Ruth said some women have come but left before taking final vows. She expects more sisters soon: "Because only God can fill that emptiness." Life as a Sister of Perpetual Adoration means vows of poverty, obedience and chastity. It includes two hours of recreation after lunch when the religious play volleyball, chat, draw, paint, sew and play music. They pray as a community before the Blessed Sacrament seven times daily and each sister spends at least one scheduled hour of Eucharistic Adoration each day. Beyond that, "during the day, we make little visits," Sister Alma Ruth said. "It's a beautiful life. Such a perfect schedule." The Vargas' siblings have more than 30 children, and the Vargas nuns greet them from from behind the grill. Their father is still alive but their mother died shortly after they took final vows. "She was so happy," Sister Alma Ruth said. "She would always encourage us to give ourselves to the Lord." But the sisters knew from other family members that their mother would cry quietly at home because she missed her girls so much after they entered the cloister. It took their father two years to accept their vocations, Sister Alma Ruth said. "It was easier for us," said Sister Alma Ruth. "You have to remember, we are here to serve the Lord. When you have a vocation, I don't think it's so difficult. You just feel so good that you have that time to be with the Lord." The Perpetual Adoration Chapel hours are 6:15 a.m. to 6 p.m. daily, Mass at 7a.m. Street parking near 771 Ashbury at Frederick and at 70 Downey St., a garage behind the monastery. adoresjesus.org. This article appeared in the October 8, 2010 issue of the Catholic San Francisco. Permission to reprint this article for the website was obtained from the Editor.